There have been some wild ups and downs in global markets in recent months, but few markets have been able to provide quite as spectacular a roller-coaster ride as Russia. Not that long ago, Russia was one of the best performing markets in the world. In 2008, however, the falls on the Russian stock market were precipitous and unrelenting, as the chart overleaf demonstrates. Never was the old adage ‘the higher you climb, the harder you fall’ more appropriate. These included “the Mechel case in July, the conflict with Georgia over South Ossetia in August, the impact of the financial crisis in September, the pressure on the rouble in October and the drop in Russia’s growth and industrial production in November and December”. What does this mean for the future of investment in Russia? Is it time to get seriously bearish about the Bear, or is there still a chance for a comeback? Håkansson’s firm East Capital has been in Russia from the off and its funds did exceptionally well in the good times. In 2005, the East Capital Russia fund returned 109.3% in euro terms. 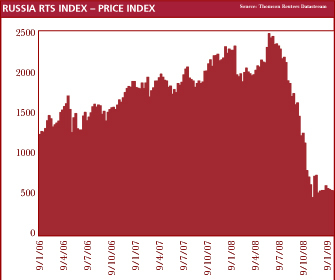 Today, it is down -4.1% year-to-date and in 2008 it lost -73.5%, slightly more than the RTS index. You might think that a fund manager in this situation would head straight for the nearest vodka bar in search of oblivion through fermented potatoes. But not a bit of it for Håkansson and his partners at East Capital, who remain upbeat. Another key plank in East Capital’s ongoing optimism about Russia is the fact that the country is no longer new to this game. It has weathered crises before. Others, however, are less optimistic. For a start, it’s a moot point whether the kind of ‘political stability’ that Russia is currently experiencing is desirable. “What we have seen recently doesn’t look very promising,” says Claude Tiramani, manager of BNP Paribas Asset Management’s Parvest Russia Fund. Tiramani includes among his concerns anxiety over whether the government will use the need to refinance at the likes of gas producers Gazprom and Novatek to bring them directly under Kremlin control. When it comes to gas there is, of course, also the gas dispute between Russia and the Ukraine over payment for gas supplies from Gazprom. Many EU customers were left without heat this winter after Gazprom cut supplies to the Ukraine. Supplies have since been restored, but the damage to relationships between the affected Central and Eastern Europe countries, and both Russia and the Ukraine is likely to be longer lasting. Plans are now afoot for a pipeline project that would bring Central Asian gas to Europe, bypassing Russia. In January this year, Gazprom was also negatively affected by news that the Swedish firm Vostok Nafta was planning to wind up the investment vehicle in which Gazprom shares are held, according to Barings’ Neues aus Osteuropa newsletter. Barings feared this would lead to a flood of Gazprom shares on the market. Even the eternal optimists at East Capital have concerns about Russia’s financial system. against a euro-dollar basket since August as the government pursues a step-by-step devaluation policy. The falling rouble has prompted savers to dollarise their savings and has depressed consumer spending, already undermined by job cuts and rises in salary arrears. This, in turn, has put a dampener on the consumer stocks that were the touchstone of non oil-related optimism about the Russian market. Other problems include corporate debt, which is a much bigger problem than in 1998. The government has stepped in to guarantee refinancing for strategically important companies through the state-owned bank VEB, but other companies may face refinancing problems, says BNP Paribas Asset Management. And, of course, there’s the low oil price, from which, to some extent, all other problems stem. Largely as a result of the collapse in commodity prices, economic growth in Russia may fall below 2% this year, having averaged around 7% over the past five years. Raiffeisen Capital Management says it is focusing on companies that either have a low level of foreign currency debt or would not be affected too severely by more rouble depreciation. East Capital was mainly liquid in the autumn, but started to invest again in January and December, targetting companies such as food retailers and power utilities. BNP Paribas Asset Management favours exporters and big blue chips (forget about mid-cap, says Tiramani), as well as consumer stocks, particularly in the telecoms field. Parvest Russia is overweight in energy stocks and underweight in banks. On the energy side, Tiramani prefers stocks that have a high exposure to refining, such as West Siberian. Refining benefits from a better taxation scheme than crude and companies with a strong emphasis on refining therefore outperform others. West Siberian also has the advantage of not being Kremlin owned, plus it is listed in Sweden, not Moscow. And what of the longer-term picture for Russia? Despite all the manifest difficulties that the country is facing, professional investors in the region are surprisingly upbeat. The oil price must rise, runs the thinking, and the government will at some point signal that the devaluation of the rouble is over. Things are far from rosy, but the likes of BNP Paribas Asset Management believe the Russian market is now pricing in an overly negative outlook. On a two-year view, the oil price will be higher, says Tiramani. In the meantime, the government has learnt from 1998 and is buying time by raising pensions and civil-service wages, thereby stabilising the population. There are many factors that are hard to predict, however. One is how the global economic situation will pan out, and in particular the situation in the US. If there’s one thing that the crisis has highlighted it’s that Russia is not insulated from global economic movements. In other words, the decoupling theory is dead.